Make your way to my heart by giving me the wifi password - or buying the £2,200 Dolce and Gabbana bag which this one is inspired by. Fashion at the moment, accessories in particular are having a customisable revamp - remember the interchangeable bag straps from last year and so so many pom pom charms. D&C - along with other designers - have taken this pretty literally and gone for a kitschy spin on customised bags. It also happens to be National Recycling week! And I'm trying not to sound like a cringey cbbc presenter, it was a really fun way to get creative and I (kinda) got a new handbag out of it. 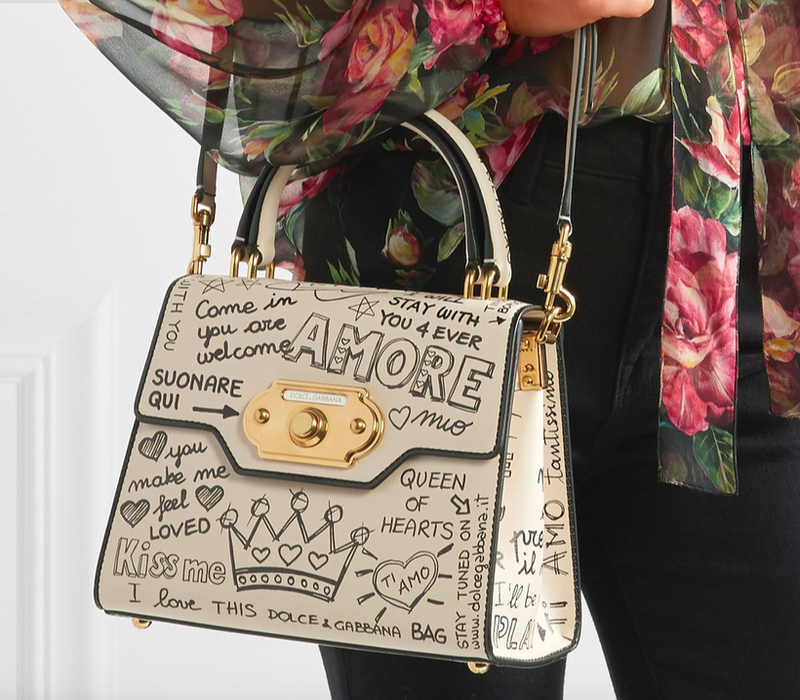 The simplest way to do this kind of thing would be to take a permanent marker and doodle all over your faux leather/pvc bag. The D&G one is called 'Welcome' and has lots of English and Italian love quotes and scribbles all over. I took inspiration from the Love and Wifi bag - being a fashion blogger/instagram addict this bag kind of spoke to me! Looking at what materials I had in the house without having to spend anything: I found some iron-on patches I'd been saving for a rainy day. I'm pretty sure the ones I've used were from a multipack at Bershka but you could easily find ones on eBay. I was hoping I'd have "LOVE" so I could more accurately recreate the bag - but I made it work with 'KISS" instead! The handbag is from Accessorise and has been used in blog posts fairly recently - I thought it would be a great one to use since mini bags are still a fashion favourite and I'll get my use out of my hard work! I originally tried to glue gun the patches on - although they are iron-on I didn't think it would go down to well trying to iron a handbag! But unfortunately the glue gun didn't make it seem very secure so in the end I used my trust Primark nail glue of all things! It's pretty much superglue, so of course you need to be fairly careful using it. Writing on the bag was the trickiest bit! I basically had one shot with the permanent marker so I did some practicing in my notebook and also traced where I was going to write with pencil on the bag. I tried to imitate the writing with swirling joined up writing. 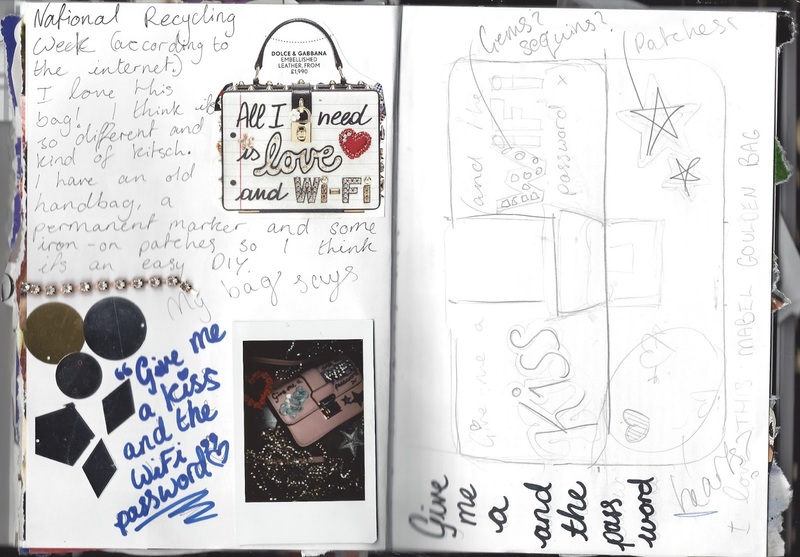 I wanted the two words 'Kiss' and 'Wifi' to have impact and of course one is a patch which I then outlined in the black marker, so for 'Wifi' I made a few sketchy marks in a blue biro around it since I was going for a scribble-in-a-notebook, blue electric vibe. I then wanted to make it a little more embellished - I destroyed an old body chain and used the dismantles to go over the word as well. Again, nail glue to the rescue! I used tweezers for this as was quite fiddly. Bags from Dolce and Gabbana are very beautiful well designed. You have tried that, take my applause. I am also creating delivery bags for many organizations. I know creating customized bags is kind of challenging. Thanks for sharing by the way!